Today,arriving at the top of Ridgebourne Road, near Hergest Common I was surprised to see so many cars parked. So, wanting to give Bandit a good run, I decided to take another route where we would be unlikely to encounter people, dogs or sheep and he could be safely let off the lead. So I walked back down the road to the Car Park for Hergest Croft Garden. In the far right of the car park is a style take this and then bear hard left. Two warnings here, there was only one dog friendly stile on this walk, and a couple are quite high, so if you have a large dog you are going to get filthy lugging them over these. Luckily for me Bandit is easy to chuck over, unceremoniously, by his harness. Also immediately after this stile the path is steep and slippery, although just a short distance to the next stile which takes you into the woodland, as you double back on yourself parallel to Ridgebourne Road. However the path does continue to be mildly treacherous in places so watch your footing. Carrying on through through the wood for about a mile you reach a small number of steps which take you onto a wider forestry path. Up to this point our walk has been generally down hill. Now the pay back starts but it is a gentle steady mile long incline and when there are breaks in the trees the views are stunning and very different from the ones you get higher up on the common. 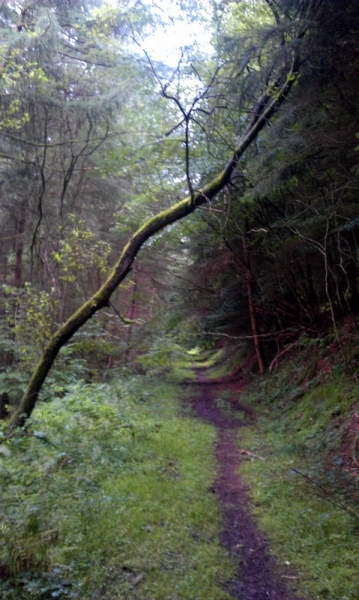 The track eventually peters out and we return once again to a narrow woodland path. I’ve never walked this way when it hasn’t been muddy, even the summer there is a lot of moisture. If you have a dog with you he’s going to get grubby. After a steady climb we reach a final stile taking us out onto Hergest Common. Here you have a choice you follow the woodland along via the left hand path which takes you back to the lower common and is reasonably easy going or you can climb straight up to the Victorian race track at the top, which is what Bandit and I did. I don’t understand why hills never seem to affect dogs. The climb to the top is about a mile and in some places excruciatingly steep. I had to stop for a number of breathers. At one point sitting on a rock gave Bandit the opportunity to leap onto my lap from which he was promptly pushed but not before he covered me in mud and sheep muck. I should have mentioned that after leaving the woods Bandit was back on his lead as there are lots of sheep and a number of horses on the common. Like all steep climbs the views are usually worth it and we encountered a number of horses with their foals too. Once at the top I decided to take the long walk around the race track and then down onto the lower common and back to the car. 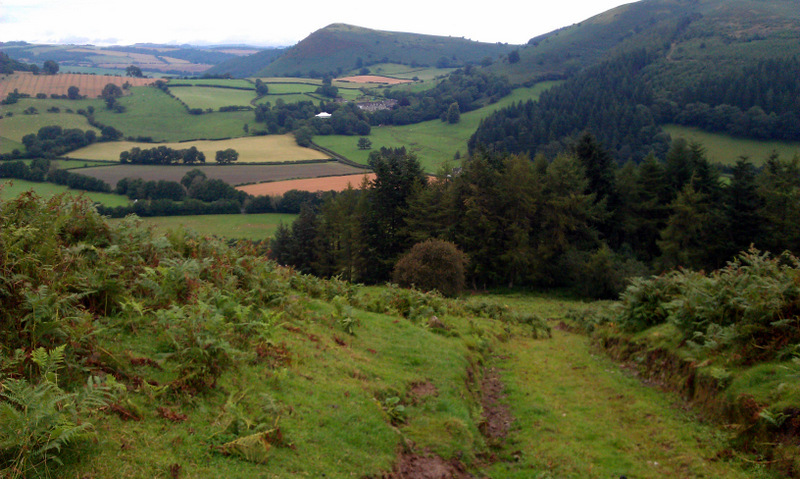 It’s all gentle from here on and feels very easy going after such a steep climb. My only regret is that I forgot to take my camera and had to use my phone instead which just doesn’t cut it or do true justice to our walk. 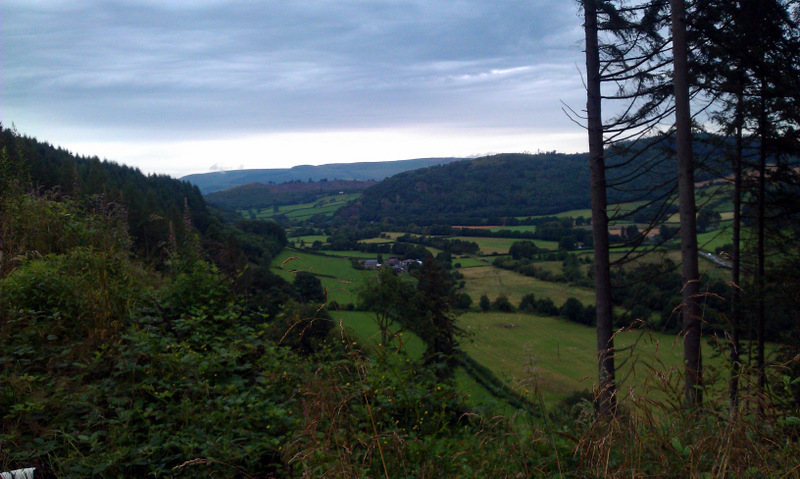 This entry was posted in Husband, Father, Dog Walker, Walking and tagged footpath, Herefordshire, Hergest Common, Hergest Ridge, Kington, Map, maps, public footpath, rambling, Walking, Walks by RedEyedMonster. Bookmark the permalink.